Or if, for some reason, the Map App on your I-Phone isn't working...The Beehive is tucked away on Franklin St., a short walk from the East Bay bike path, Independence Park and Bristol Harbor. Lots of locals rave about and recommend it. My first visit there was a few weeks ago on a sunny Sunday, sometime after 2 o'clock. Vibe: Cool Casual. Crowd was a mixed Free People reversible vegan tote bag of Bristolians, artsy and boho types of all ages, and 20-somethings in varying degrees of post-Saturday night Sundaze. Some coffee with an elephant at The Hive...When you order at the counter, "they" hand you over an animal figurine, as a place keeper of sorts, so that they know exactly which table to bring your food order to. As a first timer, I had no idea there was table service, so we walked in, hesitated, and finally, ordered awkwardly at the counter - eggs with hash browns and toast and more eggs, only with polenta, tomatoes, and tomato sauce. Afterwards, while waiting around with our coffees, we realized there was a 2nd level with a small-ish deck that overlooks the harbor. Uh, wow! Yes, Virginia, there is an upper level, including a deck from which you can get a pretty good view of the water. Of course, once the food came out (It didn't take long at all. ), we hightailed it upstairs to the deck, where we devoured our food and eavesdropped on the two college age girls dressed in workout wear at the next table, apparently ranting and raving about another girl they're friendly with. (In our defense, they were talking so loud, we couldn't help but overhear.) All the food was incredibly delicious and the portions were so generous we could barely finish them. 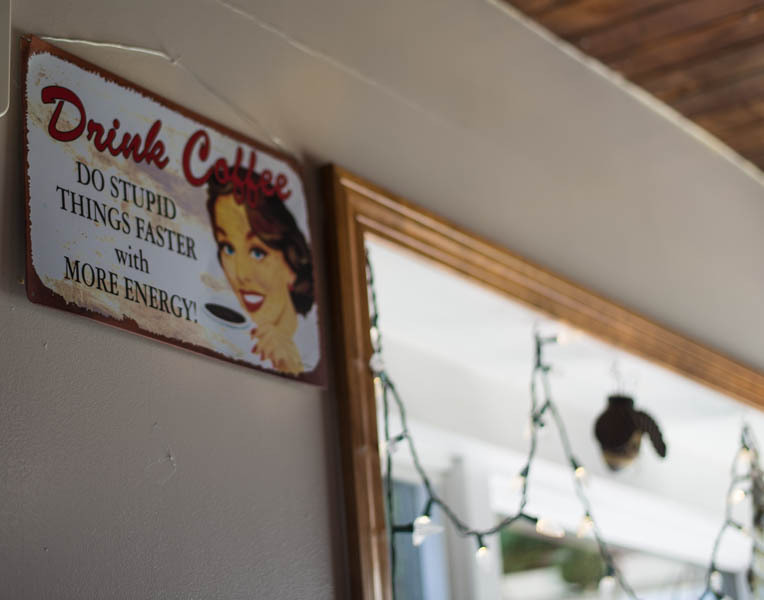 Unfortunately, however, we both agreed that the coffee was nothing to text home about, which was surprising because it's one specific thing that Beehive fans buzz about. Maybe we were there at an off time? Maybe it had been sitting in the pot too long? Idk. But based on the taste and quality of the food (and that gorgeous view from the deck! ), I'd be willing to give them another chance in the not too distant future. Celebrity Factor: Lots of actors from Trinity Rep, along with other area theaters, cite the Beehive as a fav brunch place. I also heard a buzz about Nic Cage allegedly popping in once or twice back in the days when he was selling the 24,000 ft, 12 bedroom manse, known as Gray Craig Manor House, he'd bought in nearby Middletown. Hmmmmmmmmm. I say this is the perfect place to go for a late breakfast after you've called in sick, so you get to enjoy a nice peaceful RI mid-week summer day before it slips away and we're all back to complaining about how gray, cold or snowy it is outside. (The Farmer's Almanac is , after all, predicting another doozy filled with beaucoup snowstorms and bitter temps.) Also, this year, the people behind The Beehive have gone and opened The Beehive Pantry, which offers coffee, pastry and baked goods, and prepared foods - similar to what Gracie's in Downtown Providence has done with their nearby Ellie's bakery, only a few short blocks down from G's on Washington St. (where btw my PVD friends Phoebe and Julienne swear you can get THE best cappuccinos and macaroons in the city). 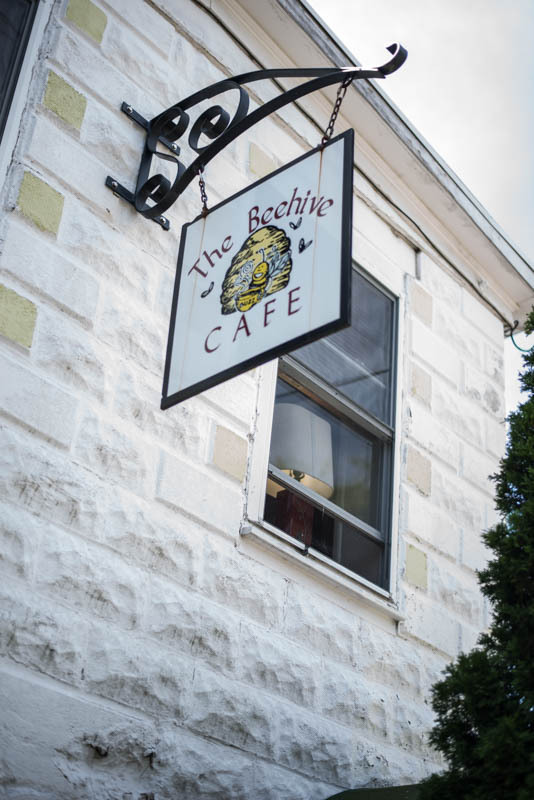 Photo Credits: The first three photos at the top (of the Beehive exterior, coffee sign, and menu board) are all by Ashley Farney. To see more of her work, click here. Staircase photo courtesy of YELP. All other photos by Patty J.